Placing orders in the evening or on the weekend is the order of the day for small companies. Unfortunately, so is waiting for an offer to be quoted and lengthy price negotiations. To meet the needs of plant construction companies such as Conaqua Wassertechnik GmbH, metering and process diaphragm pump manufacturer Lewa has now set up a web shop. For flow rates of up to 180 l/h and pressures up to 80 bar, requirements can be entered into a simple configuration tool online. So not only can you stay flexible with your time and still put the pump together on a custom basis, you even save 20% by using the web shop. Conaqua ordered four of the robust small pumps to build a new phosphate precipitation plant in Lomersheim. Since the wastewater treatment plant in Lomersheim was unable to meet the new limit values for phosphates and other materials, it was recently expanded for about 6.6 million euros. The goals of the modernisation, in addition to compliance with updated legal requirements, were also to provide active environmental protection and savings in electrical consumption. Due to their operational reliability, robustness and energy efficiency, the responsible engineering company chose LEWA pumps for construction of the phosphate precipitant metering station. The service directory listed precise requirements for the metering quantity, control capabilities and operating pressure of the pumps. The contract for construction of the metering system, along with its protective housing, piping and measurement and control systems, was finally awarded to Conaqua Wassertechnik GmbH, one of the largest providers of community metering technology in southern Germany. Since preliminary negotiations with the quotation department at LEWA had shown that the budget would be tight for the pumps despite the fact that they were already specified, the staff of the pump manufacturer mentioned to Conaqua’s general manager Ulrich Michael Binzer that the web shop’s prices were 20% lower. He has very positive memories of the entire handling and order process: "The pump shop is very well-built and easy to handle. The individual steps take the user through the order process in a very intuitive manner, and configuration based on specifications is basically self-explanatory." The main advantage for him, however, was the time savings, and the option of placing his orders seven days a week, 24 hours a day. "When I have a detailed service catalog in front of me, I don’t actually need to talk to the quotation department on the telephone. I’d rather use my time with other things. Going into the pump shop and searching for what I needed didn’t even take me 15 minutes, and I took delivery in just a few days," says the plant construction expert. The web shop was specially set up for the ecosmart pump, a diaphragm metering pump for medium requirements and a small budget. Once the online order has been placed, your delivery is ready to ship after just ten working days. "The resonance with our 20% online discount so far shows that the ecosmart web shop has brought us into a very competitive situation to the current providers in this price segment," says product manager Thomas Bökenbrink. The design of the ecosmart is based on the manufacturer’s proven technology: equipped with a PTFE sandwich diaphragm with diaphragm monitoring, damage is reliably indicated and the pump still stays leak-free and can be operated for a short time. A built-in individually adjustable pressure relief valve prevents any overload situations. The patented DPS protection system ensures that the pump stays stable and hermetically sealed even in upset conditions, so it can be started safely from any operating mode. That allows damage to the pump to be ruled out. "Reliability and availability are retained even after operator errors and in extreme operating conditions such as a closed discharge or suction line, and the pump starts immediately after the error has been corrected," explains Bökenbrink. Conaqua, which only takes work from public calls for tenders, is generally limited to offering only the most cost-effective alternatives. The company thus generally relies on pumps from other providers, with which they generally have recurring problems – primarily due to defective diaphragms. With the robust pump technology from LEWA, on the other hand, experience shows that the lifetime and energy efficiency of the entire system improve. Due to their high resistance to wear, the service and lifetime costs are markedly low, confirms Binzer: "LEWA builds very massively, with great engineering. This is really a ‘no-worries’ pump – just install it and forget about it." The ecosmart is available in four sizes and can be ordered in the web shop for flow rates of up to 180 l/h and pressures up to 80 bar. The pumps are driven with IEC and NEMA-compliant three-phase and AC motors. Due to their operational reliability, robustness and energy efficiency, the lead engineering company in the tender for construction of the phosphate precipitation system decided on LEWA pumps. 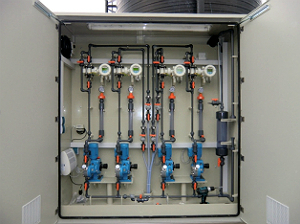 Image courtesy of Conaqua Wassertechnik GmbH.